Orlando Lind came back from elbow surgery and he pitched well for AA Orlando. He pitched so well that the hurler in his ninth minor league season started thinking big, according to The Orlando Sentinel. "I feel very good about the way I am pitching," Lind told The Sentinel. ''I want to make this the year I pitch myself to the big leagues." Lind continued to pitch well that year, ending with a 2.67 ERA. But he didn't make the majors that year or ever. 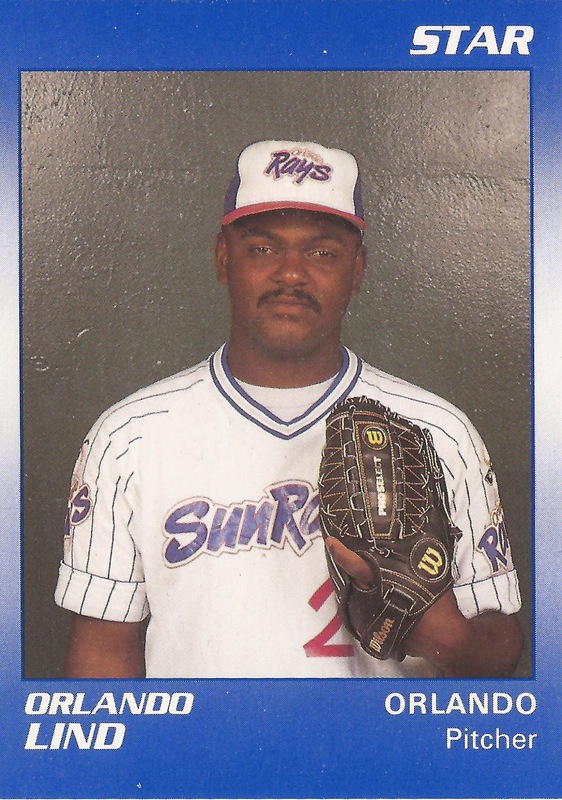 He ended up pitching a decade as a pro, but he never made the bigs. Lind's career began in 1983, signed by the Pirates as a free agent out of his native Puerto Rico. Lind followed his brother Jose Lind to the pros, his brother signing the year before Orlando. Lind started with the Pirates at short-season Watertown. In 10 outings, seven starts, he had a 7.75 ERA. He played 1984 back at Watertown, then 1985 at single-A Prince William. He went 11-7 at Prince William, with a 1.82 ERA. Lind made AA Nashua in 1986, but his season was limited to 15 outings, six starts. He went three relief innings in June, giving up a single hit. Lind split 1987 between single-A Salem and AA Harrisburg. He then played all of 1988 at Harrisburg. For 1989, Lind got his first look at AAA, getting 31 outings, five starts, at Buffalo. Lind moved to the Twins system for 1990, sent there in a trade. He split the year between AA Orlando and AAA Portland. He got seven relief outings at Portland, giving up nine earned in 16 innings. In 1991, Lind returned from that surgery and pitched in 52 games, starting seven. He went 9-8, with three saves and a 2.67 ERA. He threw an April shutout, giving up only two hits. In another outing that month, Lind went six, giving up three hits. "The club (Minnesota Twins) sent me down here to see how I'd do," Lind told The Sentinel after the three-hit game. "If I keep pitching like I did today, I won't be here long. The elbow feels pretty good. I'm 100 percent better." Lind moved up to AAA Portland, but not until 1992. In his 10th season as a pro, he got 47 outings there, starting three. He ended with a 4.68 ERA. It was his final season as a pro.